I almost got to try this bad boy out in person, but the scheduling didn’t quite work out. You’re actually lucky, as you now get to see someone beautiful in the bath, and not yours truly. Rub a dub dub. Here’s what’s up: Kohler has built something called the ‘Underscore VibrAcoustic Bath,’ which might be the coolest bit of bathroom tech that we have seen in some time. Yes, we get emails about bathroom tech. You can be jealous. 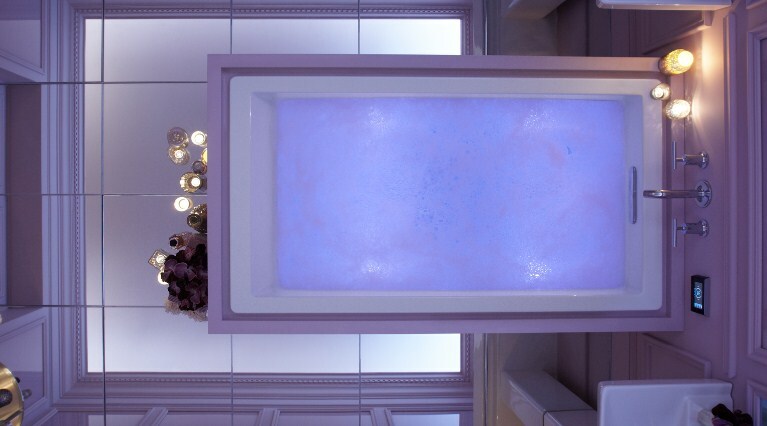 The tub has moodlights, speakers, and underwater vibrating units (that are also speakers), it works with music (yours or what is provided), turning your bath into something will blow all your senses. Hell, I would give up showering and just take baths if I had one of these; my apartment building manager, sadly, won’t allow the remodel. What can you do. Oh yeah, and the music unit has a big touchscreen so that you can control the whole deal while wet. Check the clip, you’ll want one. Bad news? The full kit and kaboodle will run you just under 5 large.